Fragmentation reported. MeteorRATs ready? ... scramble in PA! we have location! Ravi Jagtiani- Fireball termination azimuth = 320 degrees. The bylanes aren't street view mapped. 30JAN2016 Mike Johnson NE of RCHMOND VIRGINIA AIRPORT USA 18:15 PM EST 2-3 sec (E-W)RT TO LT FACING NORTH ORANGISH/WHITE VENUS/ MOONISH RIGHT B4 DISAPPEARING SMALL PIECE SEPERATED APPEARED TO BE ABOUT 5BTO 10 MILES NORTH OF WHERE I WAS STANDING.JUST BEFORE IMPACT A SMALL PIECE FRAGMENTED CREATING A SMALLER LIGHT.SEEMED TO BE COOLING! 30JAN2016 Erin Hamilton, Ontario, Canada 18h15 EST 10-15sec Left to right, facing southeast bright white, blue moon don't know I had never seen anything like it. Didn't see anything land. The light seemed to die out first. Meteor Fell on Alabama - posted in Classic Telescopes: USPS delivered my Lafayette Meteor (100x800) reflector at supper time yesterday. Ontario NJ VA DE Fireball Meteor 30JAN2016. 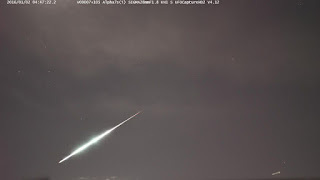 Ontario NJ VA DE Fireball Meteor 1820 EST 30JAN2016 Report your meteor sightings please-. 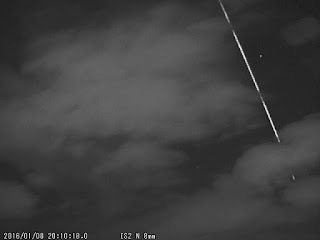 A meteor lasting the entire length of the sky 12:00(UT) 1/30/16. What was it? (giphy.com). submitted 10 minutes ago by jp_lolo · comment; share. Meteor spectra from Valasske Mezirici station, camera SW and NW (QHY5L-IIM) with 1000 lines/mm grating. Sonic Boom, Earthquake, Government Cover-Up,Meteor, Or Something More Sinister? Who Owns The Stuff In Space? N FLA, Sounds like it hit right here in Lake City. As I understand they haven't found the impact site. 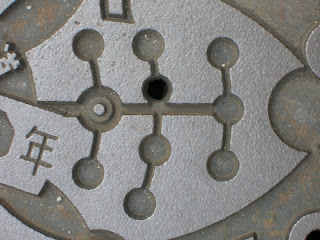 I think it was in the national forest. The 2016 edition International Meteor Conference (IMC), the International Meteor Organization (IMO)'s annual conference, takes place in Egmond, the Netherlands, from June 2 to 5. The pleasant location near the Dutch coast, at about 50 km (30 mi) from the capital city of Amsterdam, can easily be reached from there by public transportation. The IMC 2016 is followed immediately by the professional Meteoroids 2016 Conference at ESTEC, Noordwijk. A shuttle bus service will be provided. All this arguments combined might be the perfect reason for you to attend this unique event, and share your experiences with like-minded people! The most important information is summarized in the attached Newsletter, which also contains pointers to the IMC 2016 web pages where more detailed information as well as a registration form can be found. NASA estimates that the Chelyabinsk meteor was about 65 feet wide, and it released energy equivalent to at least 20 atomic bomb explosions. Daylight meteor over southeastern U.S. The Latest Worldwide Meteor/Meteorite News Japan Meteor 2010 JST 08JAN2016 - 2016年1月8日20時10分21秒アースグレージングの可能性のある . Meteorite Central shared a link: "Daylight meteor over southeastern U.S...."
The American Meteor Society has over 100 reports of a bright meteor seen in broad daylight over southeastern U.S. on Sunday. How to report it, if you saw it, here. Meteorite Central shared a link: "Found in Antarctica: first pictures of..."
Expedition from Urals Federal University finds 300 samples of suspected space debris, clues to the history of the universe. Did Ars geek out over Moon rocks, bits of the Sun, and Martian meteorites? Oh yes—Ars did. We are safe from an Apophilypse. Wait, what? People are still fearmongering about Apophis? Seriously? OK, let's start this off with the conclusion: Like the title says, the asteroid Apophis is not going to hit us in 2036. In fact, the cumulative chance it will hit us in the next century is less than 1 in 100,000. The Stardust capsule carried precious cargo that revolutionized our understanding of comets. The January 2016 issue of Meteorite Times is now up. After 'Famenin' in November now 'Moshampa', the second Iranian fall of 2015, is officially registered in the Meteoritical Bulletin Database. Double click Start to play video. Polish team found world largest urelite in Oman desert. The meteorite was found by a Polish team in 2015. The team was detained and the meteorites that they found were confiscated by authorities. Meteorite hunting in Oman is strictly forbidden and illegal under Omani Royal Decree; violators face heavy fines and imprisonment. 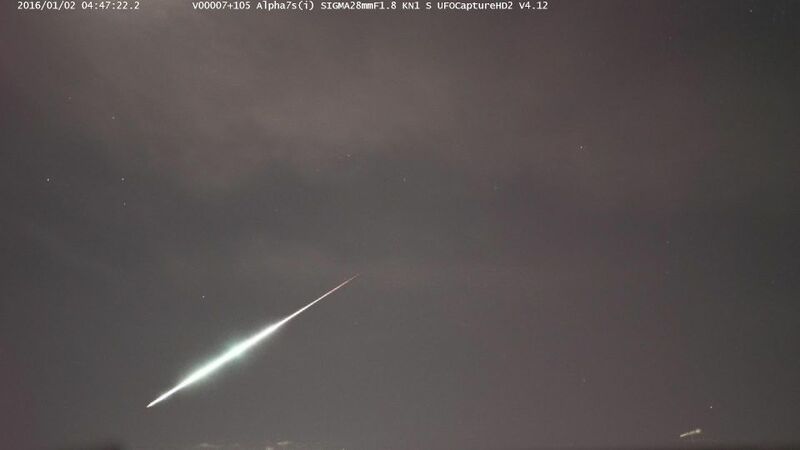 Meteorite-producing fireball observed on 19 Jan 2016 (at about 23h59m UT). The event took place over the Mediterranean Sea. It was recorded by the meteor-observing stations operated by the University of Huelva at Calar Alto, La Hita and La Sagra astronomical observatories. Caía de un meteorito observada el 19 de enero de 2016 (en torno a las 23h59m UT)sobre el Mediterráneo. El evento fue registrado por los sistemas de detección de meteoros que la Universidad de Huelva opera en los observatorios astronómicos de Calar Alto, La Hita y La Sagra. January we will likely have a large meteorite fall/s so MeteorRats be on standby! Please report your meteor sightings to this website for posting- Remember IF you are looking for a report and no one reports then everyone lacks information; thank you. There are currently 2 .... 22 known NEO Asteroids discovered that will pass within approximately 10LD or less (LD stands for "Lunar Distance"), in the month of January 2016. I expect that 10-15 or more 10LD NEOs will be discovered before month end. Expect some spectacular bolides, fireballs, and meteors this month and especially large ones 3-5 days before and following the passing of 13 small mountain-sized NEO asteroids and 1 comet, diameters ranging from 500m- 2.5.km, that will safely pass this month. Be ready for some bolide, fireball, and meteor activity!